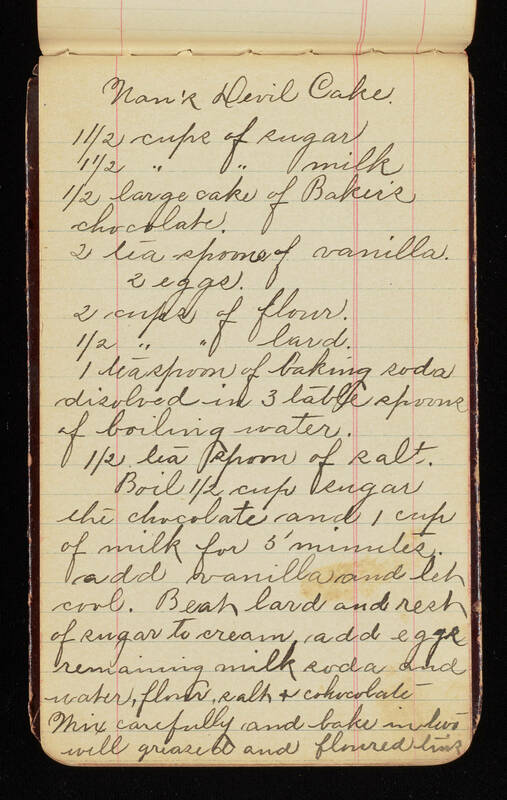 Nan's Devil Cake 1 1/2 cups of sugar 1 1/2 " " milk 1/2 large cake of Baker's chocolate 2 teaspoons of vanilla. 2 eggs 2 cups of flour 1/2 " " lard 1 teaspoon of baking soda (disolved)[sic] in 3 table spoons of boiling water. 1/2 tea spoon of salt. Boil 1/2 cup sugar the chocolate and 1 cup of milk for 5 minutes. , add vanilla and let cool. Beat lard and rest of sugar to cream, add egg remaining milk soda and water, flour, salt + chocolate- Mix carefully and bake in two well greased and floured tins.